Welcome to our Southern Maine picnic, inspired by the glorious fresh bounty of July by the sea. We begin with sparkling fruity Prosecco and Lambrusco Sangrias to sip with fresh oysters on the half shell, adorned with a colorful mignonette sauce, stunning Crostini appetizers of fresh pea pureè topped with local lobster claws and lemony Amontillado Hollandaise sauce. The main course is scrumptious cheesy Portobello burgers crowned by pickled red onions, avocado mash and baby arugula. Garden fresh grilled vegetable sides of asparagus, fennel and leeks are accompanied by Moroccan spiced corn on the cob. The finale to the feast is homemade Maine blueberry cheesecake ice cream popsicles with a do-it-yourself dark chocolate magic shell coating. In this post, I am introducing my Red, White and Blue Sparkling Sangrias with their descriptions, ingredients and preparation directions. Each subsequent blog post will feature the next course of the meal. Part 2 showcases the picnic’s appetizers, toasted by these sensational sangrias. Sparkling wines are so very festive and refreshing. I am particularly fond of Prosecco, a white Italian favorite from the Veneto region. It is not too sweet, not too dry, and not too expensive. Perfect for fruity summer sangria. I added Lambrusco, a light and bubbly red Northern Italian wine, to balance the party’s colors, flavors and personal pleasure. I paired the Prosecco with strawberries and ripe nectarines. The Lambrusco is paired with ravishingly beautiful freshly picked raspberries and blackberries. The nectarines are cut to bite sized pieces and skewered with small strawberries to adorn the white wine glasses. The raspberries and blackberries are whimsically skewered to bejewel the red wine glasses. Remaining fruit medleys from each group bathe in their own separate saucers of cognac to macerate for an hour or two. The skewers and macerations can be done ahead, covered and refrigerated, until ready to serve. I used one pint of each berry and 4 nectarines for one bottle each of the bubblies. For the maceration, use just enough cognac, or your favorite unsweetened spirit, to cover the bathing fruity beauties in their shallow bowls. 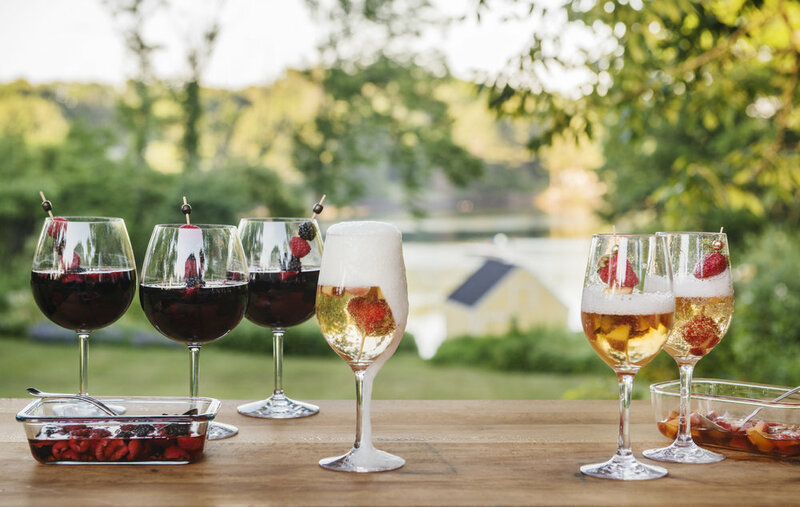 When serving, add a small ladle of the red or white maceration concoctions to the bottom of their designated glasses, and garnish with a skewer of the same fruits. Fill each glass, upon request, with the desired fizzy flavor. Stay tuned for Part 2 of our Picnic at Coastal Maine’s Mead Meadow featuring freshly shucked Maine oysters on the half shell, adorned with colorful mignonette sauce, and stunning local Lobster Crostini appetizers of fresh pea pureè topped with lemony Amontillado Hollandaise sauce.